One of the area’s most familiar seasonal landmarks which is a feature in the district for more than half a century is illuminated at the start of December. The star was built in 1952 by Bernard Baker who saw some fluorescent tubes being thrown away and saw the potential of building a illuminated star out of them. Initially the star was hauled to the top of the tower by the men of Hearsall Baptist but in 1961 Cyril Cobb built the vertical metal runway up the tower and the star is still lifted up this runway today. John Pettifer rebuilt the electrics in 1967 and continued as team leader until the late 1980’s, when Paul Eaves took over the job. In 2003 the whole system needed major restoration. The runway was dismantled, with the aid of a cherry-picker, and the whole system was overhauled. The electrics on the star itself were re-commissioned with the help of donations from local people and groups who appreciated the stars appearance at Christmas. The star is left on day and night, as often the weather is gloomy, and it shines out at all times over Christmas reminding people of its true meaning. The star does cost to maintain and run, and in 2009 the church had the stonework of the tower renovated at a cost of £9,000. Even though this was not a star item it had to be done to keep the structure sound for the star to attach to. 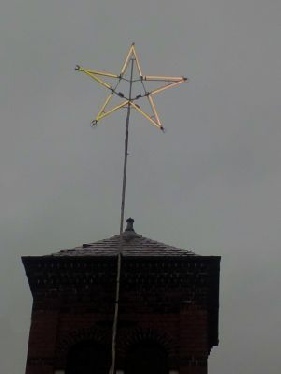 The Hearsall star is an important Christian symbol in Chapelfields, Earlsdon and wider afield, it can be seen all the way from Corley Moor and it heralds the start of Christmas for many people in the area. You can usually see the star being erected on a Saturday in early December.